Drama, drama, dating drama. Buffy the Vampire Slayer Season 2 Episode 5 is filled with the plight of teenage romance. 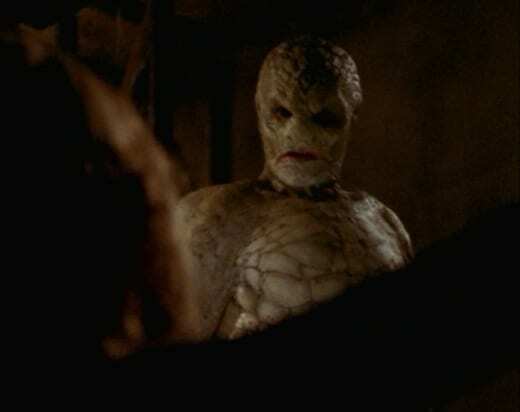 Before Buffy and Angel truly started going out, we had "Reptile Boy." This was the last hurdle they had to overcome before officially dating. If you're a major Buffy and Angel shipper, this is a must for you. Let's jump right into rewatching "Reptile Boy"! Buffy the Vampire Slayer Season 2 Episode 5 might have one of my favorite intros from the entire series. The scene hooks me right away every time I see it. This could be due to the glass shattering and the running; it's so fast-paced and intense. An evil cult was obviously going to be the setup as the Monster of the Week. Come on, we had the robes and chasing frat boys. And, we never see the face of the human villain unless we're meant to see them again later on. What was up with Giles and his attitude? He was being really harsh to Buffy for no reason. Sure, they all live on a hellmouth with dangerous demons running around and Buffy needs to be on her guard. However, as Buffy mentioned, it was a slow time. She can't be killing vampires and demon every night for the sake of it. Giles could've gotten his request across without the foul treatment. Cordelia: Come on, Richard and his fraternity brother wanna meet you. Buffy: Well, I don't really wanna meet any fraternity boys. Cordelia: And if there was a God, don't you think he'd keep it that way? Permalink: Well, I don't really wanna meet any fraternity boys. The moment when Cordelia grabbed Buffy to talk with the frat guys was perfection. You could sense the dread in her voice. She didn't want to get her involved. Charisma Carpenter had great comedic timing with her expression/voice. As I mentioned above, we saw Richard the cult member again. Him being connected to Cordelia was another foreshadowing to the trouble coming. We were supposed to know the frat party, and these two guys, were going to be bad news. I'm not saying this in hindsight after all these years of rewatching "Reptile Boy." Even back then, he just had "nice guy red-herring" written all over him. Plus, if he was friends with Richard and part of the frat, he had to be evil too. His nice guy act was too suspicious. He was too nice and earnest to Buffy; he wanted to win her over and get her to the party. And for a junior in university, he didn't need to be going after high school girls. The creep factor is strong with this one. Buffy: Hmmm...history stumps me. I have a hard enough time remembering what happened last week. Tom: Nothing happened last week. Don't worry, I was there. Permalink: Hmmm...history stumps me. I have a hard enough time remembering what happened last week. Buffy and Angel's scene in the graveyard was overly dramatic. "Soap opera" isn't a strong enough of a word to describe it. We get it: Angel and Buffy shouldn't date because he's a vampire and she's the teen Slayer. It's dangerous and trouble could happen for them both. However, Sarah Michelle Gellar showed why she earned her Daytime Emmy. Angel and Buffy's dialogue reminded me of a young adult novel. Painful longing mixed with dramatic flair. Don't believe me? Check out the quote below. Angel: You just wanted coffee or something? Angel: I knew this was gonna happen. Buffy: What? What do you think is happening? Angel: You're 16 years old, I'm 241. Angel: You don't know what you're doing. You don't know what you want. Buffy: Oh no, I think I do. I want out of this conversation. Angel: Listen, if we date, you and I both know one thing's gonna lead to another. Buffy: One thing already has led to another. You think it's a little late to be reading me a warning label? Angel: I'm just trying to protect you. This could get out of control. Buffy: Isn't that the way it's supposed to be? Angel: This isn't some fairy tale. When I kiss you...you don't wake up from a deep sleep and live happily ever after. Permalink: No. When you kiss me, I wanna die. Still, why couldn't Angel take Buffy out for a coffee? It's only a coffee! This is the most non-committal date idea people have. In fact, if they had an actual date, potentially it could've shown them that they shouldn't be together. Angel should've just asked her out a long time ago. I wish Cordelia and Buffy had more scenes together on Buffy the Vampire Slayer. Seeing all their moments together reminded me that we didn't get much of it during the series. Cordelia's ask to Buffy was pure Cordelia character dialogue. No one else could've uttered those words except for her. I loved seeing the excitement on her face when Buffy agreed. It looked like she won the lottery. She was so happy for the chance to be in the presence of an Anderson. Cordelia: Well, you see why I have to go! Buffy, these men are rich and I’m not being shallow. Think about all the poor people I can help with all my money. Cordelia: You’ll go? Great! I’ll drive. Oh Buffy, it’s like we’re sisters...with really different hair. Permalink: Oh Buffy, it’s like we’re sisters...with really different hair. Prepare yourselves, everyone: we're still in "Xander is crushing on Buffy" territory. When I was younger, I couldn't wait for this plot to end. Rewatching it again after all these years has not changed a thing. I think it should've ended after Buffy the Vampire Slayer Season 2 Episode 1. Luckily, "Reptile Boy" was one of the last few episodes to push this storyline. He begins to move on from her and focus on Cordelia soon. We only had to make it through this last bit of obsession. Evil frat party aside...it looked like a fun party. Sure, we got all the typical party cliches like the drunk frat guys, the dancing and the pledge hazing, but these are common TV tropes. We're so used to seeing these on TV that it's become the standard. Buffy the Vampire Slayer Season 2 Episode 5 was no exception. Still, the minute Richard handed Cordelia and Buffy drinks, my inner-red alert alarm went off. Obviously there would be drugs in the drinks. Like I said above, we wouldn't have seen Richard's face as the villain if we weren't supposed to know he and the fraternity members were evil. After all these years, I still don't understand why Tom was being set up as a potential love interest. Why waste the screen time? He and Buffy had A LOT of flirtation. Their dance together was intimate and sparks were flying everywhere. It's a shame to see her start opening up to someone only for them to obviously be evil in the end. Was it only a ploy to get her to the party? If so, why the romance for the rest of the night? There were some images I could've done without during my childhood, and that might be one of them. Don't get me wrong, it's funny and I'm one of the first to raise their hand to like when karma gets their revenge on Xander, but it seemed pointless to the overall story. The way it was edited together came off hectic and creepy. I would've left during that portion of the party. Giles: She lied to me? Angel: Did...she have a date? Willow: Well, why do you think she went to that party? Because you gave her the brush-off. Willow: And you never let her do anything except work and patrol. And I know she's the chosen one, but you're killing her with the pressure. I mean, she's sixteen going on forty! Willow: And you! I mean, you're gonna live forever. You don't have time for a cup of coffee?! Willow: Okay, I don't feel better now, and we've gotta help Buffy. Permalink: You don't have time for a cup of coffee?! She said exactly what Giles and Angel needed to hear. Both of them were being particularly stubborn to Buffy, especially more so during "Reptile Boy." Somebody needed to call them out; I'm glad it was Willow. Sure, Buffy lied and went on a date to the party, but her rebelling was against them. If they only listened to her before, things would've gone differently. Seeing Willow start to shed her quiet wallflower nature was a big move for her character development. If you've been following along with me during these rewatches, you would've noticed how different Willow has become. Her courageousness had started working its way in for a while now. Machida. I can't help but laugh every time I see him. You'll see why during one of the full body shots. Pay close attention to him after he is summoned. There is a moment when Tom is threatening Buffy and you can see Machida's full costume. A very visible line break appears that separates his special effects shirt and the tail potion. It's a quick shot, but it's a clear editing error. I read somewhere awhile back that Machida was meant to be an ongoing recurring villain but was cut due to special effects/budget. I'm happy this change was made as Drusilla, Spike and Evil Angel are perfect villains for Buffy the Vampire Slayer Season 2. Cordelia had the best line of the night after Buffy and the Scoobies stopped the demon. I laugh every time she says, "I hate you guys." 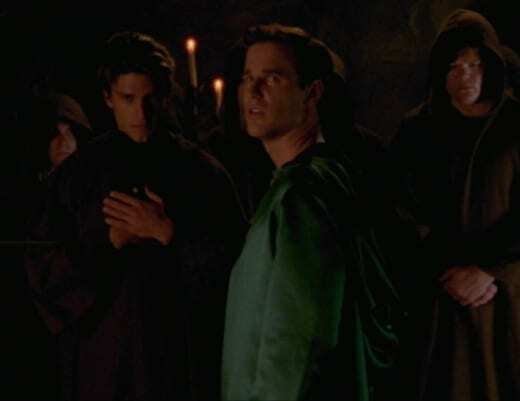 In the Buffy the Vampire Slayer timeline, Cordelia had only started interacting with the Scoobies on a friendly level since Buffy the Vampire Slayer Season 1 Episode 11. It had only been seven episodes since they saved her life. Cordelia already realized that evil finds this group wherever they go. We can't forget that Cordelia chose to be their friend. She was never a major part of the group, but she still joined in to help save people when she knew danger was coming. This is one of the reasons why I love the character of Cordelia. The ending for "Reptile Boy" was so satisfying. Not only did the members of the fraternity get arrested and all the past members suffered, but Buffy got her date request with Angel on her terms. And her walking away was her boss moment. She was living for having the last word. What did you think of "Reptile Boy"? Were you happy Tom was a one-off romance (before finding out he was evil)? Would you have lied to Giles to go to a frat party? How would you have responded to Angel asking you out for coffee? Want to join us in rewatching Buffy the Vampire Slayer? We'll be posting new rewatch posts every Tuesday and Thursday. Come back here and share your thoughts in the comments about the episode.